We’re thrilled to announce that after a lot of hard work, countless nights, and more coffee consumed than we could have ever imagined, we are releasing a new app built specifically for coffee-lovers and indie coffee shops in late October! Since the release of our beta version of the app nearly a year ago (time flies! ), we’ve passed thousands of dollars to our partners, delighted countless coffee-lovers, and even raised $1 million in funding to dream bigger. At every step, we’ve been documenting requests and feedback from our 75+ early partners with the promise that we would release a new experience that incorporated as much feedback as possible. What does this mean for my shop? Beginning 10/4, we’ll be working on your behalf to make the transition as easy as flipping a switch. As a first step, we’ll be replicating your existing menus and business information into the new app. We’ll be dropping by Seattle area locations to provide your new tablet and stand pre-installed with the new app to receive orders. For non-Seattle Area partners, we'll ask that you update the app on your existing device and will be sending new tablets and stands the following week. What about my joe customers? One free drink on joe! Your customers will be asked to download a brand new app on the 15th. As a “thank you” for continuing making the jump to the new app (the old app will no longer work on the 15th), joe is paying for one free drink to all of your existing joe customers and any of your loyal customers you think should use the app! 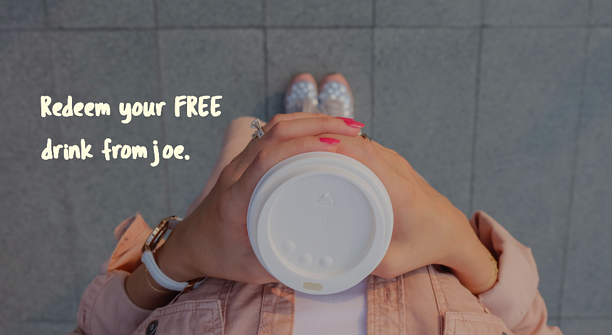 It’s important that loyal joe users know they get a free drink when they make the switch to the new app on October 15th. We'll be emailing and reaching out to customers on your behalf to make sure they're aware of the switch ahead of launch. Connect with us 7 days a week using our live chat (bottom right) or send us an email at success@joe.coffee.